The following products are available from the Online Ording Form on Doug's website: Wildland Fire Specialists. This book contains 142 pages of useful and tested information. Contains 55 pages of exercise material, consisting of questions, photos of fire and tactical exercise maps. A handy 13-page guide that contains pocket cards detailing wind shifts on Warm and cold fronts, the sundowner mechanics, type of fire and matching tactic, logic size-up and a thunderhead card. 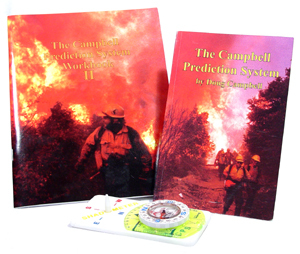 Set Includes 6 fires titles on one CD: South Canyon 1994, Initial Attack using CPS, 1966 Loop fire Hotshot crew burnover, Calabasas engine burnover, 30 mile fatality and Cerro Grande prescribed burn escape, Cramer Fire of 2003. Copyright © 2009-2015 Emxsys. All Rights Reserved. Emxsys is a trademark of Bruce Schubert.